Jon Stewart came out of his all-too-brief retirement last month to sign a a four-year production deal with HBO, where his “unique prism” will presumably be used to cast a humorous light on the many ways in which the world is going to hell in the proverbial handbasket. (Has anyone told John Oliver yet?) But recent political chicanery has forced Stewart back into action sooner than he anticipated—he doesn’t even have a platform from which to blast Congress’ continued inaction. Lucky for him, he knows a guy/network. Stewart called in a favor and dropped by The Daily Show on Monday night to talk about the James Zadroga 9/11 Health And Compensation Act, which provides health care funding and compensation to the first responders who developed respiratory and other diseases after breathing in god-knows-what while at Ground Zero. The legislation expired in October and has yet to be renewed, despite all the “never forget” tweets from politicians whenever the anniversary of the 9/11 attacks rolls around. Seeing that his predecessor was in a bit of a bind, current host Trevor Noah let Stewart have the floor (but not his old/new chair) for the remainder of the show, which saw the former host play TDS correspondent for a change. The first of Stewart’s two segments featured a video of his visits to the offices of Republican Senators Rand Paul, Ron Johnson, and Rob Portman, where he was accompanied by a few first responders. Stewart joked that he intended to shame the senators into following through on their tweeted promises, as they had yet to make any moves to renew the Zadroga act. Although he was thwarted by their aides and press secretaries, Stewart did confirm that Senator Portman later made his support of the bill official. But Stewart and the first responders still have one major (turtle) hurdle to clear—Senate Majority Leader Mitch McConnell, who Stewart claimed was refusing to move the extension bill forward for purely political reasons. He seemingly baffled Noah when he told the host that McConnell had publicly spoken in support of aiding the stricken first responders, only to stymy it in Congress after “he didn’t get concessions about loosening oil-export regulations.” Later, at Noah’s “suggestion,” Stewart attempted to reconvene a panel of emergency personnel that he met with five years ago to discuss their health woes. But only retired firefighter Kenny Specht was healthy enough to return—two of his fellow first responders were too ill to appear, and one had died in the years since. Stewart’s frustrated plea ended with a call to action, but after Noah pointed out that no one uses their phones to place calls anymore, the tactic shifted to social media. 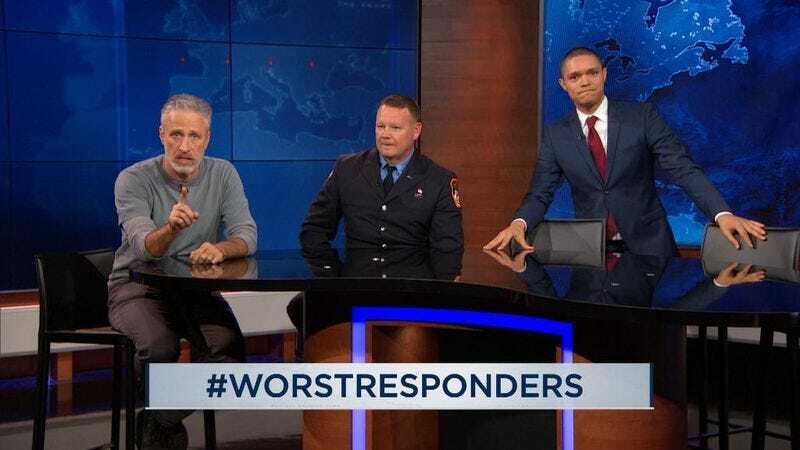 Stewart’s “End The Fuckery” hashtag was deemed a little too abrasive, so the trio agreed on #WorstResponders, which has already gained some traction online.